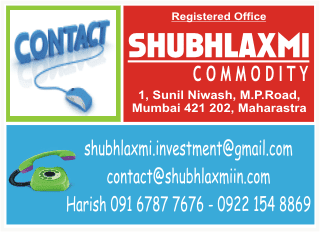 MCX Zinc crossed the high of Rs106.25. However it faced resistance near the 78.6% retracement mark (Rs109.5) and the weekly upper Bollinger Band (Rs107). From there zinc seems to have started a new leg down. The daily momentum indicator has triggered a bearish crossover. The supports for the base metal in the short term are at the 20 day moving average (DMA; Rs102.4) and the 40 day exponential moving average (DEMA; Rs101.5). The commodity is expected to test the rising trendline (Rs100.6). Once that is broken the previous low of Rs95.5 would be the next level on the downside. Reversal can be kept above the high of Rs108.7.